(2016). Low temperature hydrothermal synthesis, characterization and optical properties of Sr6Nb10O30 – Nb2O5 nanocomposite. International Journal of Bio-Inorganic Hybrid Nanomaterials, 5(1), 27-31.
. "Low temperature hydrothermal synthesis, characterization and optical properties of Sr6Nb10O30 – Nb2O5 nanocomposite". International Journal of Bio-Inorganic Hybrid Nanomaterials, 5, 1, 2016, 27-31. (2016). 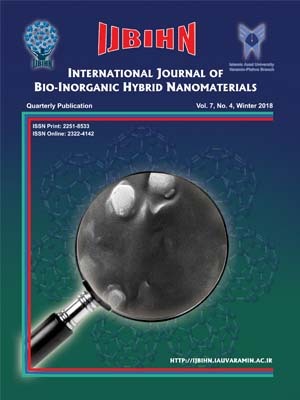 'Low temperature hydrothermal synthesis, characterization and optical properties of Sr6Nb10O30 – Nb2O5 nanocomposite', International Journal of Bio-Inorganic Hybrid Nanomaterials, 5(1), pp. 27-31. Low temperature hydrothermal synthesis, characterization and optical properties of Sr6Nb10O30 – Nb2O5 nanocomposite. International Journal of Bio-Inorganic Hybrid Nanomaterials, 2016; 5(1): 27-31. Sr6Nb10O30–Nb2O5 nanocomposite was synthesized in 2M NaOH aqueous solution. A stoichiometric 1:1 Sr:Nb molar ratio hydrothermal method at 120°C was used to synthesize this nanocomposite. Sr(NO3)2 and Nb2O5 were used as raw materials. The synthesized nanomaterials were characterized by powder X-ray diffraction (PXRD) technique. It was found that Sr6Nb10O30 was crystallized in tetragonal crystal structure with space group P4/mbm and cell parameters of a = b = 12.3548 and c = 3.896 Å. Nb2O5 crystals were also found in orthorhombic and monoclinic crystal structures. Nb2O5 lattice parameters were found as a= 6.175 Å, b= 29.175 Å, c= 3.93 Å and a= 12.73 Å, b= 5.56 Å, c= 4.88 Å with γ= 105.1°, respectively for the orthorhombic and monoclinic crystal structures. The morphologies of the synthesized materials were studied by field emission scanning electron microscope (FESEM). The FESEM images showed that the synthesized nanocomposite had flower and sponge-like morphologies. Ultraviolet–Visible (UV-Vis) spectra showed that the synthesized nanocomposite had strong light absorption in the ultraviolet light region. FTIR spectrum of the obtained nanomaterial was also studied.